On November 1, the leaders of China, Japan, and the Republic of Korea (ROK) met for a highly anticipated trilateral summit in Seoul for the first time in three years. 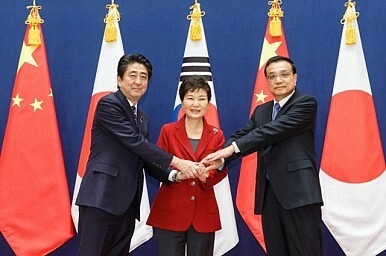 Chinese Premier Li Keqiang, Japanese Prime Minister Shinzo Abe, and ROK President Park Geun-hye agreed that the three countries should move their relations forward based on the spirit of “facing history squarely and advancing towards the future.” Following the trilateral, Abe had bilateral meetings with Park as well as Li. For Tokyo, this meeting is certainly the first step in mending its ties with China and Korea—relationships that have been derailed and dysfunctional for the last two years. Considerable challenges remain for Japan to capitalize on the goodwill that was seemingly created at the summit. Abe entered the meeting from a position of strength, having articulated strong support for the recent U.S. freedom of navigation operation (FONOP) in the South China Sea (consistent with Abe’s vision of Japan as a “defender of global commons”), and the recently concluded TPP agreement. The three leaders hailed the summit, jointly declaring that their trilateral cooperation has been “completely restored.” However, most observers agree that this is hardly the reality. Matters are different for Japan especially. It is clear that Tokyo will continue to face complex diplomatic challenges with its neighbors in East Asia with little prospect for a major breakthrough in the near future. Let’s begin with Tokyo’s relations with Beijing: while the both sides agreed to begin the consultation on the mechanism to manage tensions in East China Sea, there has been virtually no progress. While it is certainly in Tokyo’s interest to prevent further deterioration of its relationship with Beijing for economic reasons, the fundamental challenge that Japan continues to grapple with regarding China—namely how to discourage China from asserting its maritime claims in an aggressive manner—remains unresolved. Japan can certainly pursue its own cooperation with the United States and other interested parties in the region to develop the environment to dissuade China from further assertive behavior. However, this ultimately requires a multinational solution, and Japan alone cannot exert much influence to shape China’s behavior in this regard. Relations with the ROK are just as—if not more—challenging. Following the trilateral summit, Abe and Park met for a bilateral summit for the first time since either of them assumed office. Park has strongly insisted that the comfort women issue needs to be “resolved” before Tokyo and Seoul begin dialogue about future cooperation. Although her stance has softened a bit in recent months, Park still expressed her strong hope that the comfort women issue will be “resolved” by the end of this year. But such a “resolution,” as U.S. Assistant Secretary of State Danny Russel described during a recent interview, needs to be one that where the ROK can be confident with regard to Japan’s sincerity. Additionally, Tokyo can rest assured that the agreement will have political validity beyond the current administration. If the two countries cannot get past the comfort women issue, it will continue to prevent the bureaucracies in both countries from effectively consulting and cooperating on security challenges, including North Korea. For Japan, it was certainly beneficial that last week’s summit meeting took place. It sends an unambiguous message that Japan is willing to pursue a constructive relationship with its East Asian neighbors. The road to “advancing toward the future” with its neighbors, however, continues to be rocky for Japan.